Havanese: the most honest dog breed review you'll ever find about Havanese temperament, personality, and behavior. A Havanese may be right for you. A Havanese may not be right for you. You can avoid some negative traits by choosing an ADULT dog from an animal shelter or rescue group. With an adult dog, you can easily see what you're getting, and plenty of adult Havanese have already proven themselves not to have negative characteristics. Finally, you can avoid some negative traits by training your Havanese to respect you and by following the 11-step care program in my book, 11 Things You Must Do Right To Keep Your Dog Healthy and Happy. Grooming. Coat care is a major responsibility. Havanese require weekly brushing and combing, and also clipping and trimming every couple of months. Otherwise their coat keeps growing and turns into a matted mass. For ease of care, consider clipping the coat short so that brushing and combing is minimized. Then your Havanese will look like an adorable puppy throughout his life. Housebreaking problems. 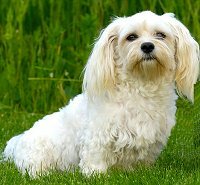 The Havanese belongs to the same "family" of dogs as the Bichon Frise and Maltese and all of them are slow to housebreak. Consistent crate training is mandatory. Sometimes a doggy door is necessary so the dog can go out whenever he needs to (though that can lead to another problem if he stays outside and barks!). You will have greater success if the potty area is covered, since many Havanese despise getting wet. Read more on housebreaking your Havanese. If the potential housebreaking problem sounds like a deal-breaker to you, don't give up! Consider adopting an already-housebroken adult Havanese from a rescue group. Potential separation anxiety. More than most other breeds, the Havanese needs a great deal of companionship and does not like being left alone for more than a few hours. He is likely to express unhappiness by barking or chewing things up. Providing enough socialization. The Havanese tends to be a bit standoffish with strangers. If you don't do enough socializing, or if you do it the wrong way, their natural caution might become shyness or suspiciousness. Read more on socializing your dog. Potential barking. Like most small dogs, the Havanese may be quick to bark when he hears or sees something new. But you can prevent your Havanese from developing a chronic barking habit by establishing the right relationship between the two of you, where you are the leader and he is the follower. When your Havanese respects you, he will follow your rules and stop what he's doing when you tell him "No." Read more about respect training. Potential health problems. Most Havanese are long-lived. But they are very prone to allergies that can disrupt their quality of life. 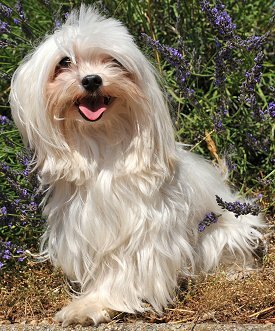 Havanese can be allergic to fleas, grass, pollen, and so on. Allergies cause a dog to scratch and chew himself into horrendous skin conditions. Other concerns in the breed are urinary problems and bladder stones, along with loose knee joints that may require surgery. Read more about Havanese Health.